Podium Players Community Theater is holding auditions for the comedy Elvis Has Left the Building, by V. Cate and Duke Ernsberger, on Sunday, April 8th and Tuesday, April 10th. Sunday auditions will be held at East Hampton Library, 105 Main St., from 2:00-4:00pm. Tuesday auditions will be held at East Hampton Middle School Commons, 19 Childs Rd., from 6:30-8:30pm. Roles include the Colonel (male), Elvis’s manager; Trudy (female), the Colonel’s capable German assistant; Roscoe (male), an awkward office worker; Candy (male), the Colonel’s friend; and Jill Turner (female), ace reporter. Audition forms can be obtained at the website, www.podiumplayers.org, and completed ahead of time. Bring a recent headshot and resume, if available. Brief plot synopsis: Elvis Presley has disappeared. No one knows of his whereabouts. But the Colonel is all shook up because he has racked up a enormous debt that no one knows about — and with the King missing, the only way to pay it off is to find an Elvis impersonator within 24 hours. Hijinks ensue as the Colonel takes desperate measures to replace a man who is irreplaceable, all the while keeping the prying eyes of a nosy reporter at bay, and figuring out what happened to the real Elvis. 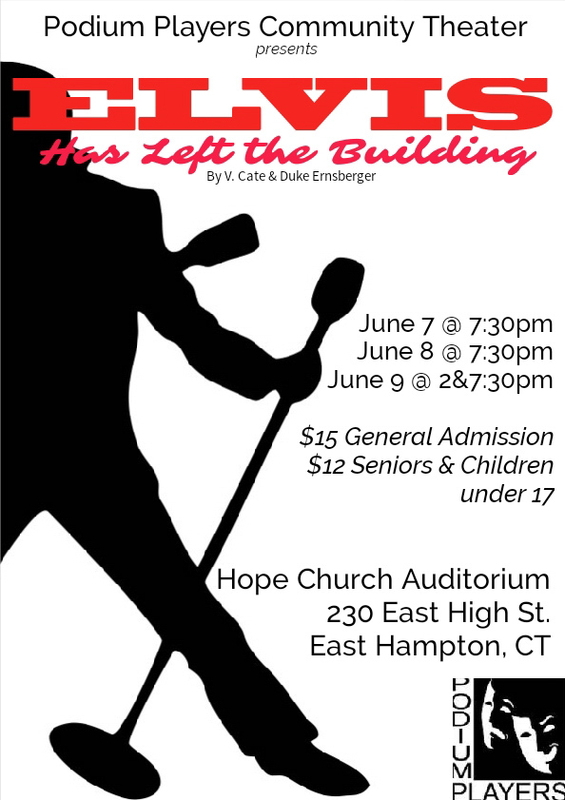 Elvis Has Left the Building is directed by Michele Rowalle Gagne, and is scheduled for four performances from June 7-9, 2018, at Hope Church, 230 E High St., East Hampton. Rehearsals are set to begin on April 12. Visit facebook.com/podiumplayersct for more information.